Representatives from the four Morrow County school districts and the local food pantry accepted coats, baby clothing and other items Wednesday. In the center is Beverly Robinson, executive director and founder of Coats 4 Children. MOUNT GILEAD — Winter isn’t that far away, despite the unseasonably warm weather in north central Ohio. That means winter coats are needed — and for 68 elementary school children in Morrow County they’ll receive brand new ones through Coats 4 Children. “This is a wonderful county. We found out about the need that is here. This is the power of communication and solving problems,” said Beverly Robinson, executive director and founder of Coats 4 Children. Robinson said the all-volunteer organization is in its 11th year. This fall they will deliver to 53 schools, seven youth organizations and two houses of worship. Megan Burson, counselor at Cardington-Lincoln Elementary School, is grateful for the coats. “It will benefit our families. We have a definite need. It’s nice to be able to meet the needs of students at the moment they’re needed,” Burson said. She and representatives from Northmor, Mount Gilead and Highland elementary schools picked up the coats Wednesday morning at Job and Family Services. United Way of Morrow County Executive Director Jodi Hayes also appreciated the donations. 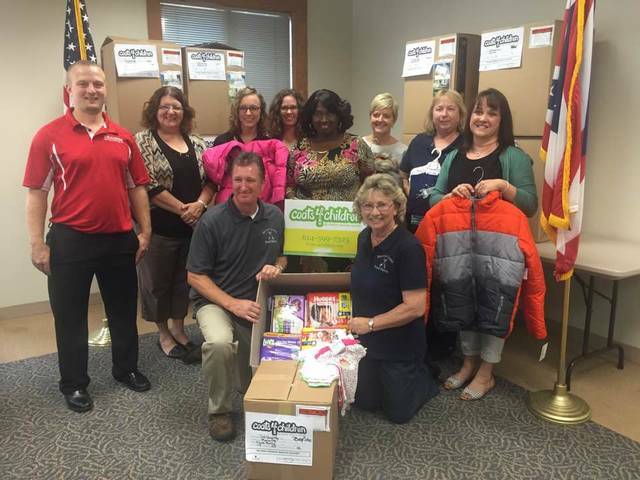 “We are excited to be able to partner with Coats 4 Children. Giving children warmth allows them to keep their focus on learning,” Hayes said. In addition, Coats 4 Children delivered 607 diapers and 560 baby wipes, along with baby outfits for 18 boys and 24 girls to the food pantry. Its partner Leaders Moving & Storage Co. delivered the boxes. “School principals, teachers, counselors, we couldn’t do this without you. We are volunteering our time, talent and service for the betterment of our community,” Robinson said. This was the agency’s first visit to Morrow County. https://www.morrowcountysentinel.com/wp-content/uploads/sites/29/2017/09/web1_newcoats4children.jpgRepresentatives from the four Morrow County school districts and the local food pantry accepted coats, baby clothing and other items Wednesday. In the center is Beverly Robinson, executive director and founder of Coats 4 Children. Reach the organization at www.coats4children.org.